Both Bar Mitzvah, Hebrew for “son of the commandment”, and Bat Mitzvah, “daughter of the commandment”, are called to the Torah to celebrate this special rite of passage into adulthood at the age of 13. From that day on, it is Jewish tradition that he or she is responsible for all the religious duties of an adult. Our youth prepare for this important day with extensive study of Judaism and Hebrew through our Religious School. They engage in the process of Tikkun Olam, repairing our world, by completing a mitzvah project, keeping a journal of their experiences and how they are helping to repair the brokenness of our world. Our youth help conduct the Shabbat worship service, read from the Torah and Haftarah and deliver a D’var Torah–a speech about the meaning of the weekly Torah portion. An inclusive tradition at Or Chadash is the passing of the Torah from generation to generation.The Talmud, the Jewish book of law and legend, contains a section known as Pirke Avot. Pirke Avot opens with the phrase “Moses received the Torah on Sinai, he handed it on to Joshua, Joshua gave it to the elders, the elders to the Prophets, the Prophets to the men of the Great Assembly.” From the Great Assembly, the Torah was passed on to all Israel. We mirror this passing of the values of our tradition as grandparents, parents and the Bar or Bat Mitzvah gather on our bimah to hand the Torah to the next generation, symbolizing that the Bar or Bat Mitzvah is the latest link in the chain of tradition that goes back to the days at Mt. Sinai. After the Torah is passed, the child then turns to the congregation and recites the Sh’ma, the watchword of our faith. Aliyah is a Hebrew word that means ascent, an ancient reference to going up the mountain to Jerusalem to pray or offer sacrifices. Today it denotes the honor of being called up to the bimah to participate in the reading of the Torah. At Or Chadash we welcome parents and grandparents of all faiths to participate in the Torah service with appropriate readings and blessings for them — including the traditional blessings before and after the Torah reading and the Salkin prayer. 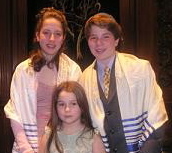 Click here to see examples of Mitzvah Projects.